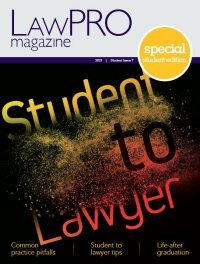 LAWPRO has prepared fact sheets to highlight the most common causes of malpractice claims for major areas of practice. While the most common causes of malpractice claims are remarkably similar regardless of firm size, there are some interesting variations with specific areas of law. For each practice area, these fact sheets highlight the common scenarios that lead to claims and the steps that can be taken to lessen the risk of a claim.